L-aptamers are synthetic target-binding oligonucleotides built from non-natural L-nucleotides. Like their conventional brothers, the D-aptamers, L-aptamers fold into distinct shapes that bind the respective target with high affinity and selectivity. Furthermore, the mirror-image configuration confers plasma stability and immunological passivity. Various L-aptamers against pharmacologically attractive targets were shown to be efficacious in animal models and three have shown safety and efficacy in clinical trials. 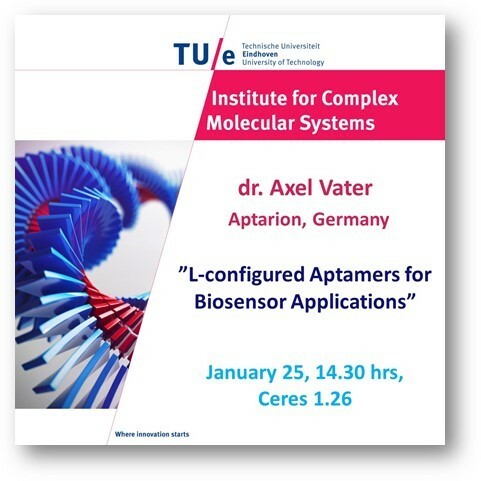 Recently, the technology platform was applied for identifying L-aptamers as functionalisation molecules for biosensors. Two aptamers against chemokines (small pro-inflammatory proteins) that are present in blood and mucus were generated and immobilised on the chip of a surface plasmon resonance device for measuring the concentrations of the respective chemokine. L-aptamer activity remained high when they were immobilised via a functionalised carbon nanomembrane using click chemistry while it was hampered when immobilised to a carboxylated methyldextran surface. Spiked chemokines could be specifically measured in “Universal Transport Medium” of swab samples and in plasma. Versatile chemistry for covalent immobilisation at either end available, purely chemical synthesis (standard procedure), extreme biological stability, high physicochemical stability, high shelf life, affinity in the nM-pM range (down-tunable for continuous monitoring), high specificity.